When Charles Rolls and Tim Warrillow decided to set up a business together it was the first time they had ever met. This was back in 2003, and Mr Warrillow - at the time a 28-year-old advertising executive - was looking for a complete career change. He wanted to set up his own gin distillery. And so he contacted Mr Rolls, a veteran of the gin industry, and 18 years his senior, for advice. Mr Rolls, who had successfully grown Plymouth Gin, agreed to meet for a coffee in central London. Within an hour or two they had decided to become business partners. But instead of forming a new gin company, they resolved to set up a premium tonic water brand. Mr Rolls, 57, recalls their first meeting: "The conversation quickly turned from gin to tonic water, and the fact that while there had been a huge increase in the number of premium gins, when it came to the tonic water you added to them, you essentially only had two choices - the market leader [Schweppes], or supermarket own brands. "And these all contained artificial sweeteners. We decided there and then to launch a premium tonic water, with all natural ingredients." But was either of them concerned about going into business with someone they didn't really know? "Not really," says Mr Rolls. "I could see an energetic, but pretty mature and determined individual. Tim was exactly the right type of person." Mr Warrillow, 39, adds: "It was very apparent from our first few meetings that we seemed to understand each other." And so their business, Fever-Tree, was born. It is named after the colloquial term for the cinchona tree, from whose bark the natural anti-malarial drug and core tonic water ingredient, quinine is produced. But while it took Mr Rolls and Mr Warrillow just a few hours to decide to go into business together, it then took them 18 months to find a recipe they were happy with. As Mr Rolls had some money in the bank after selling his 25% share in Plymouth Gin, they were able to take their time. In their efforts to formulate their recipe, they flew to the Democratic Republic of the Congo to source pharmaceutical grade quinine from a plantation, and hired plant hunters to help them find other flavourings, such as a bitter orange grown in Tanzania. Securing some outside investors, they were finally able to start selling bottles of Fever-Tree tonic water in 2005. 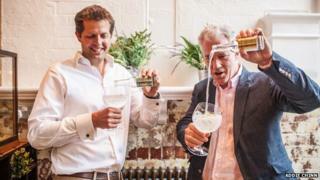 Mr Warrillow says: "The intention was to treat the launch like a premium spirit company would do - in the first instance try to get Fever-Tree stocked by the best hotel bars and restaurants. "This is a great way of building reputation, prestige and word of mouth. And it was all about the shoe leather - we walked to the most exclusive hotels and restaurants in central London, getting them to taste our tonic water against the competition." With such venues quick to get on board, the company then got what it says was its most important break - upmarket UK supermarket group Waitrose phoned to say it would like to start selling Fever-Tree. Mr Rolls says: "Tim thought this was a perfectly normal development, but I had to keep telling him that it is incredibly unusual for a supermarket group to chase you. It is almost always the other way round, and hard work. "Yet the buyer was incredibly enthusiastic, and just a few weeks after Waitrose starting selling us, she phoned to say we had a hit on our hands." With the UK's other supermarkets quick to follow suit, exports then followed, and London-based Fever-Tree is now available in 50 different countries. It has also introduced other products, such as a reduced calorie - but still all natural - tonic water, ginger beer, and lemonade. All are produced for it under contract by a company in the south west of England. Fever-Tree now sells 65 million bottles per year across its range, and employs 70 people, but Mr Rolls says it still has substantial growth potential. He points out, for example, that it currently has only a "single digit percentage" of the UK tonic water market. Yet for all Fever-Tree's continuing success, have there been any problems along the way? Mr Rolls says: "There were some production bottlenecks in our early days... but perhaps my biggest regret is not putting in all the money myself to get Fever-Tree started. "Broadly speaking we needed about a million quid to get the company off the ground, and put on a bit of a road show around the City of London. All it did was delay us, and I ended up putting in half the money anyway. If you ask for a mistake, that was it. "But that is with the benefit of hindsight. There are some unbelievable risk takers out there, but it doesn't appeal to me personally. And our investors have been very good." But do the two men ever argue? Mr Rolls, who recently became executive deputy chairman after handing over the chief executive role to Mr Warrillow, says: "Of course we disagree from time to time, but it is only ever about small things, not the big issues. And if it happens, we say to the other, 'If you feel that strongly about it, go ahead and do it.'" Mr Warrillow adds: "In terms of strategy, routes to market and funding, I don't think we have ever had a significant disagreement. "As long as you have mutual respect you can go a long way further in business with two heads rather than one."